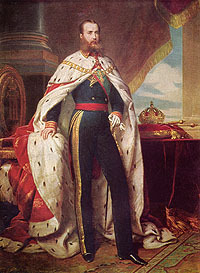 Maximilian I (1832-1867), Emperor of Mexico from 1864-1867, qualifies as one of the country's most ill-fated rulers. Hailing from a European dynasty, Maximilian was duped into accepting the role of Mexico's emperor. Brought to the country under false pretenses, the archduke of Austria was led to believe his presence would be welcome by the people of Mexico. In fact, the opposite was true. Mexico was experiencing the painful residues of a civil war (The War of the Reform) when Maximilian arrived in Veracruz in 1864. Mexico's president, Benito Juarez, supported wide sweeping reforms for the country. This deeply angered the conservatives and the church who sought to maintain the status quo. In 1861, President Juarez suspended interest payments to Britain, Spain and France. Juarez took this drastic measure out of necessity to help stabilize the country's infrastructure. This decision, however, set off a chain of events that ultimately culminated with Maximilian's arrival. In response to President Juarez' decision, Napoleon III of France persuaded Britain and Spain to join forces with his country and demand repayment from Mexico. The Treaty of London was signed in 1861 for this purpose. However, France had ulterior motives that went beyond the settling of a debt. Napoleon III sought to take advantage of Mexico's instability by establishing a monarchy in the country. Once Britain and Spain learnt of France's true intent, they withdrew from the treaty. Napoleon III remained resolute and French soldiers were promptly dispatched to Mexico. The Battle of Puebla occurred during this time, a rare Mexican victory over a foreign country. This famous engagement gave birth to the tremendously popular Cinco de Mayo holiday so widely celebrated today. Despite Mexico's success at the Battle of Puebla, the French soon emerged victorious and took command of Mexico City. This occupation was welcomed by the conservatives and members of the clergy who hoped to have their powers restored by the forthcoming monarchy. Maximilian was enjoying the life of a country gentleman when Napoleon III approached him concerning the role of emperor. A member of the Imperial Habsburg-Lorraine family of Europe, Archduke Ferdinand Maximilian of Austria had a received a fine education. However, he possessed a naive nature that led him into dangerous circumstances. As a result, Maximilian became embroiled in an international melee that would have no happy ending. Napoleon III convinced Maximilian that Mexico had authorized his appointment. In truth, a mockery of a vote had been staged. Led to believe their presence would be welcomed, Maximilian and his wife Charlotte looked forward to their new home and dominion. They set sail for Mexico. 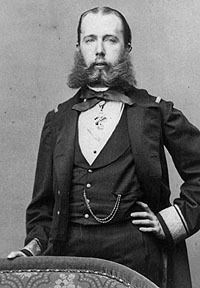 Maximilian was crowned Emperor on April 10, 1864. Both he and his wife immersed themselves in Mexico's culture. Charlotte changed her name to the Spanish equivalent and was known as Empress Carlota. A humanitarian at heart, Maximilian could not help but notice the great disparity between the country's rich and poor. To the great dismay of those who had put him in power, Maximilian supported the liberal social reforms set forth by President Benito Juarez. The United States had been embroiled in its own civil war during the French occupation of Mexico. However, once this war was over, the United States made it clear that they recognized Benito Juarez as Mexico's legitimate president and reminded France of the Monroe Doctrine. As a result, Napoleon III was successfully pressured to withdraw his troops from Mexico. Without military support, the Maximilian monarchy was destined to fail. Empress Carlota returned to Europe to beg Napoleon III and the Pope to reconsider their decision. Her pleas fell on deaf ears and these futile attempts proved to be the downfall of Empress Carlota's sanity. She lived out her life in Europe, in seclusion, never to see her husband again. Maximilian was encouraged to flee for his life. He adamantly refused, fully committed to Mexico and her people. Maximilian had grown to love his adopted country and felt responsible for her future. Before long, Maximilian was captured and sentenced to death. Pleas came from around the world, imploring President Juarez to spare Maximilian's life. These pleas were in vain. 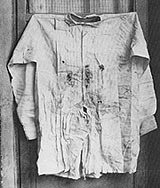 Maximilian was executed by a firing squad on June 19, 1867. A famous chapter in Mexico's history had come to an end.